Here at Extreme Sports X, we absolutely love hitting the road, the dirt, the mountains and the trails on our bikes, so we’re all pretty keen to find out about any up and coming bikes out there. We’re big fans of the affordable and sturdy Mongoose range, and so today we aim to tell you about five of the best Mongoose mountain bikes, your hard earned money can buy. 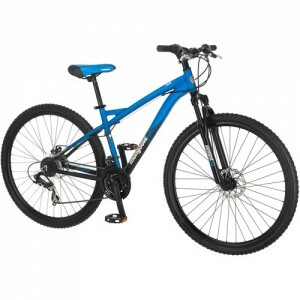 This is a great bike at a great price! 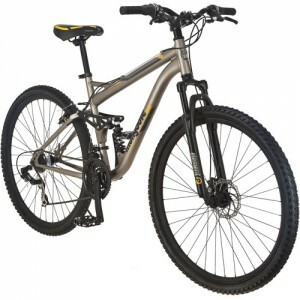 Currently heavily discounted, you are going to be picking up a bike with a great aluminium frame, full suspension both front and rear, with impressive 29 inch wheels, which makes this a fantastic bike for anyone looking to tackle tricky off road conditions. Don’t buy this bike to ride to work and back, but do buy this bike if you want to have a lot of fun up and down hills, through the woods and along some challenging dirt tracks! This is a lovely bike to ride. 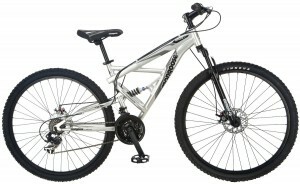 You’ve got discs to front and rear, and dual suspension with excellent SR suspension forks at the front. This bike takes the sting out of big drops and rough terrain, and it also performs well enough on the road. You’ve also got a fantastic Suntour crankshaft along with alloy pedals, set off by excellent Shimano 24 speed trigger shifters. With a high quality frame, specifically designed to go hand in hand with these monster 29” wheels, this bike just feels great! You really notice that the set up is spot on, and there’s a certain harmony to the way the bike rides. As you’d expect, it comes with a full suspension package, excellent SRAM shifters coupled to Shimano rear derailleur and front disc brakes. A great bike that’s just great fun to ride! OK, so you might not find this one quite as affordable, but it’s worth throwing out there for any of you big spenders! This really is the crème de la crème of bikes produced by mongoose. We’re talking about a FreeDrive DH Frame which provides 190mm travel along with 150mm Maxle dropouts, RockShox forks, along with a state of the art SRAM drive train. 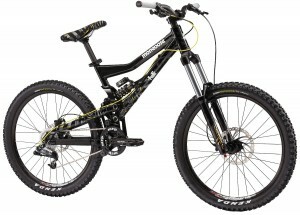 This bike is for the serious enthusiast who wants nothing but the best in downhill biking build quality. Every part of this bike is top of the line, so if you want the best, then check this bike out today! This is a fantastic bike to pick if you’re looking for something well balanced, well made, but not designed to break the bank! You’ve got a lightweight aluminium frame, suspension forks to take the pain out of some off road riding, along with disc brakes and the front and rear to ensure you stop as quickly as you start! 21 Shimano gears mean plenty of scope for different speeds and different inclines, and the build quality of the bike means you can tackle different terrain with confidence. 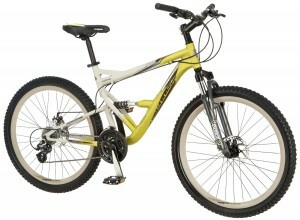 A great all rounder which would suit all styles and abilities. This entry was posted in Bikes, Land Sports, Mongoose, Mountain Biking, Mountain Biking, Reviews and tagged Mongoose, mountain bikes, Mountain Biking. Bookmark the permalink.